Easter smoked turkey was a success. I love this thing. man i would have checked after miss number 1! do some searching on homemade honeypots. blurs the line a little on regulations because it's not really edible, so not bait but also above liquid amounts used for scent. it's setback farther than it looks in the pic, but yeah there's some "melting" already from a grease fire on the previous grill. eh, i like the part that confirms what archers have long been worried about. 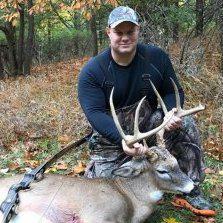 idiot gun hunter joins peaceful archery woods. And before someone says it, for those of us that hunt pressured small chunks of wood or public land, yes they do affect our hunting. not to mention nobody wants to see wounded deer because of said idiot. good point. Would love to have seen a kid on the cover of the report, although in full disclosure I'm sure they have been in the past. why would archery numbers be up if the rut was late? crossbow is at the end of the season. wouldn't you rather shoot a tom? more meat right? hey Wolc, I know you love statistics. Why are crossbow harvests down 8% from 2017? you know that ladies night is to get woman into bars so that men will want to go to the bars and spend their money right?